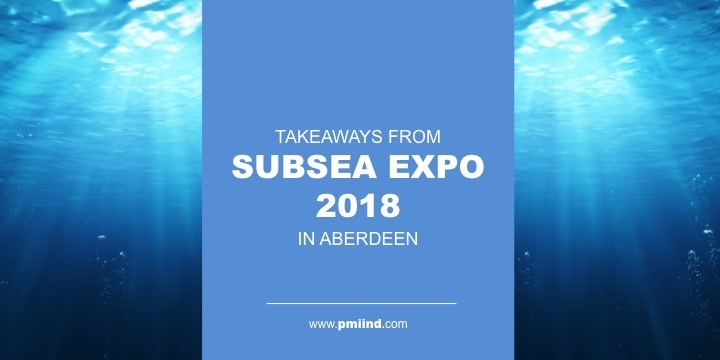 PMI certainly enjoyed the always educational environment at Subsea Expo 2018 in Aberdeen! It was a pleasure to meet with so many energetic and skilled specialists working within the industry. The innovative solutions our industry develops continue to amaze and inspire us within the promising direction of the offshore energy market. From the Awards Dinner, State of Sector/Industry Overview Keynote Session presented by Subsea UK Chief Executive Neil Gordon, to the breakout sessions, panel talks, and networking events, Subsea 2018 was surely an event not to be soon forgotten. The conference offers a unique environment attended by Subsea operators, supply chain engineers, CEOs, sales marketers, developers, IRM companies, cable suppliers, and more. The expo is a breeding ground for innovative solutions and partnerships to further evolve today’s subsea industry. Through our many conversations with game-changers in the industry, a few common themes emerged that we wanted to share with you as our conference takeaways. Much of the current market buzz seems to revolve around the possibilities surrounding AUV & ROVs. The implementation of remote subsea junction charging boxes for AUVs would eliminate the costly need for traditional subsea cables. Instead, the vehicle would plug into a charging station on the sea floor. This opens up a multitude of new opportunities surrounding sea floor connections, potential cost benefits, and the need for specialized remote subsea junction box cables. In addition, reiterated throughout the event was a strong emphasis of the need to educate and train the next generation of subsea market leaders for an exciting, yet challenging industry. This was also evident throughout the exhibit hall with opportunities for pupils to experience various facets of the subsea industry, from operating machinery with virtual reality, to Subsea UK and OPITO’s “Energise Your Future” campaign. It was not uncommon to run into multiple local high school pupils attending the expo and looking to absorb all the knowledge and information they could. While these young, future leaders may currently not hold the answers for commonly shared frustrations around market conditions, lead times, costs, and CAPEX restrictions, it was a friendly reminder that within years, a fresh pair of eyes may be able to revolutionize the markets we’ve all taken part in growing to the high level which it is at today.